Time to report in on what is going on here at Langara. Big news this afternoon, after four weeks on the sidelines with an upper body injury, Korey Fletcher has returned to beef up our guiding team. Welcome back and wow, that was a quick recovery, next time stay out that zodiac and forget about what’s in those coolers! 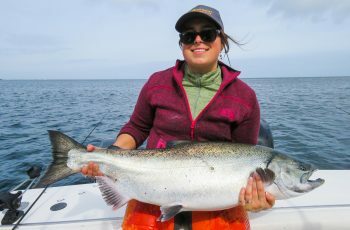 Our most recent trip concluded today, and the fishing was reasonable steady, with seven tyees and two of those fish at 40 lbs. Top rod Gary Hayden grabbed a beautiful 40 lb specimen out at Cohoe on Predator 2 and promptly released it healthy and back on her way to spawn. Well done Gary! Davis Aycock released a 40 as well on a self guided mission, I think that is the largest self guide release of the year here at the Club! 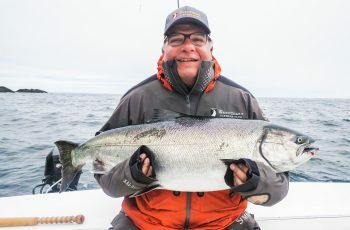 First timer Brian Budden with the PCL boys caught and released a 34 in boat 17, this Brians largest salmon ever, and what a start! Could have easily wacked it on the head, instead set an example to us all, and gently released her. The guides were proud of you Brian! There were several other tyee in the low thirties. The fishing was centered out at Cohoe Point for the most part, fishing deeper off the cable, 100 to 120 feet. 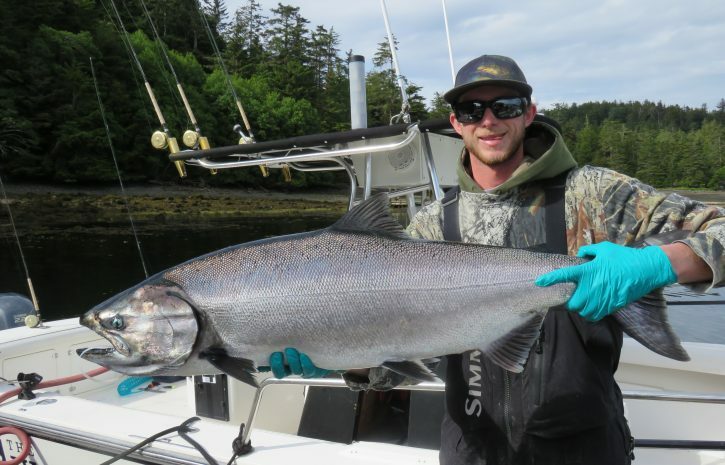 The pinks were a problem at times, and some guides switched over to the metal, others were digging the plugs. Pat seemed to fill his tote down at Boulder trolling 2.5 knots with the superiors, Jordie seemed to enjoy the plugs , grinning away proudly on each of his hook-ups. This could be one of the largest pink runs going by in many years, at times thousands boiling on the surface. The hardware can save a guides sanity, serenity now! There seems to be feed everywhere, lots of juvi herring and some hawgs as well. 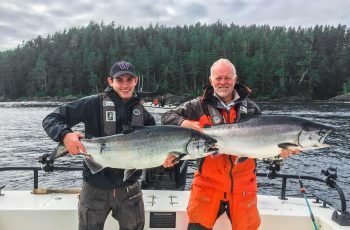 We are finding some decent fishing around these balls, Hans sat on a set this afternoon and promptly had a 37 lb tyee pounding out line and putting on a crazy show. At one point Hans radioed he had a shark on the line, now that is a scream! 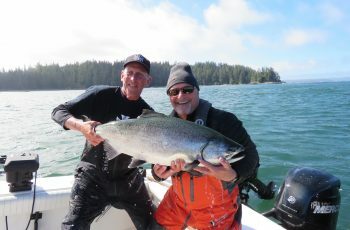 The coho continue to show at a nice pace, out fishing with Bruce Knight we had coho to 12.5 lbs. 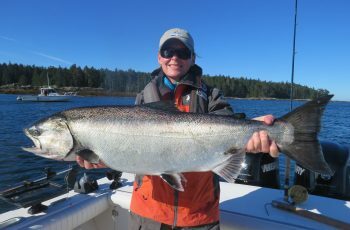 Springs were slower for most of us, more fish in the teens today, although there were two tyees on the fish board. A run to the river for the impatient guys produces plenty of silver action!